If you are struggling to keep up with your monthly payments and have more than one mortgage on your home, Chapter 13 bankruptcy may provide the relief you need. Under Chapter 13 bankruptcy law, you may be able to remove a 2nd mortgage from your home and discharge the debt in bankruptcy. The discharge will release you from all personal liability on the mortgage and extinguish the lien placed on your property. At Florida Law Advisers, P.A., our bankruptcy attorneys have helped many homeowners prevent a foreclosure and lower their monthly payment by filing for bankruptcy. Bankruptcy is a useful tool but it may not be the right solution for everyone. You should contact us to schedule a free consultation with a Tampa bankruptcy lawyer before taking any action. During the consultation we can explain exactly how the bankruptcy process works and what you can expect by filing for bankruptcy. A secured loan is a loan that has collateral, such as a car loan or home mortgage. In Chapter 13 bankruptcy secured creditors must be paid in full, however, unsecured creditors do not. Unsecured debts in Chapter 13 may be discharged without receiving any payment. Therefore, if a 2nd mortgage is treated as an unsecured loan it may be discharged without requiring the homeowner to pay any portion of the debt. Once the 2nd mortgage is discharged it will no longer be a lien on the property and the homeowner will be released of all liability. In order to classify a 2nd mortgage as an unsecured debt, the market value of the home must be equal to or less than the balance of the first (primary) mortgage. Collateral will not be left for the second mortgage if the market value does not exceed the amount owed to the primary mortgage, and thus the loan will be treated as an unsecured loan in bankruptcy. The market value of the home will be determined by an independent home appraiser and reviewed by the court. Once the discharge is entered by the court, the mortgage lien will be deemed void and automatically extinguished without any further court action necessary. Homeowners have a lot of options when it comes to fighting foreclosure and we want to make sure our clients choose the best strategic plan for their family. 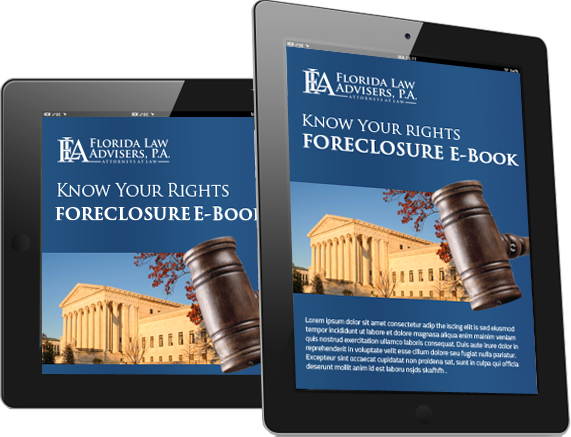 Whether you want to keep your home and prevent foreclosure, or walk away from your home without being responsible for any of the debt, Florida Law Advisers, P.A. can help. Our Tampa foreclosure defense attorneys have years of experience helping homeowners in all types of foreclosure defense and bankruptcy matters. Our foreclosure defense lawyers will carefully evaluate your individual situation, advise you of your options, and develop a comprehensive legal strategy to help solve your mortgage problems. Contact us today to schedule your free consultation with a foreclosure defense lawyer at our firm.